You might be surprised at some of the benefits of having a turntable at Kidderminster! 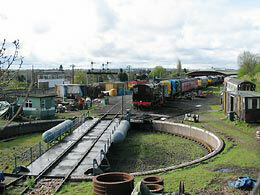 ﻿The original plan to install the turntable at Bewdley was changed with the purchase of Kidderminster Yard by the SVR. Restoration of the turntable parts began in 1992, and two years later, contractors George Law Ltd of Kidderminster installed the ring of concrete, with volunteers carrying out the rest of the work. The table was craned into its pit in April 1994, and the first turning was the six-ton steam crane in July. The centre bearing can carry 115 tons and consists of 21 steel ball bearings, each two inches in diameter. Each of the outer running wheels can carry 34 tons. The table is moved either by manually turning the handles, or by the twin cylinder vacuum motor, operated by the locomotive's braking system. The pit wall was constructed using 8,000 blue engineering bricks, laid in English bond, backed by concrete building blocks. From early days of this project, a hedgehog escape tunnel was decided upon. This idea expanded into an access ramp, designed so that any wildlife falling into the pit could get out again. The ramp also allows easy access for maintenance of the table, and its width will allow tractors to enter the pit, if necessary. The SVR Charitable Trust’s predecessor, the SVR Rolling Stock Trust, took over ownership of the turntable from the Kidderminster Turntable Fund in 2009. But a few years later, there were problems. Tree saplings had infiltrated the pit floor to such an extent that in 2012 a locomotive had become stuck, half way round. “The gang from Worcester Bosch followed up on work started by several work experience lads from local schools. They set about clearing vegetation, and a contractor removed the boulders from the pit floor. We laid a micro pore membrane, topped with tarmac road scalpings that would be more user friendly for later upkeep visits. “With a safer footing to work on, attention then turned to the turntable steelwork. It hadn’t been painted since its installation 20 years before, and was in need of a refresh. “One of the Worcester Bosch service engineers let slip that he had been a ‘brickie’ when he first left school, and we persuaded him to lay the huge diamond-pattern, bullnose edge bricks around the turntable rim. All the Charitable Trust had to do was buy the cement and sand!